11 years after the introduction of the Sontronics SIGMA, one of the world's first phantom-powered ribbon microphones, we are proud to release the stunning UK-made SIGMA 2. This, along with the new DELTA 2 and APOLLO 2, represents the pinnacle of ribbon microphone technology. The original Sontronics SIGMA has been one of our most popular microphones thanks to its incredible performance and value for money, and it quickly became a must-have in studios and venues around the world. Following our experiments with the highest quality components (which resulted in our beautifully crafted, multi-award-winning ARIA and MERCURY valve condenser mics), we decided to turn our attention to our ribbons, and after two years of investigation, significant investment and tireless testing, a new generation of unmatched quality ribbon microphones was born. results that sit perfectly in any studio or live mix"
SIGMA 2's circuitry incorporates RFI (radio frequency interference) filters that ensure that SIGMA 2's signal remains interference-free and makes the microphone even more suited to live use than before. Ours are the only ribbon mics in the world to boast this feature! SIGMA 2 has extremely high sensitivity and incredibly low self-noisemaking it ideal for capturing vocals, speech, solo woodwind, stringed instruments and guitar amps*, presenting an exceptionally detailed, accurate, natural sound. Utilising the same super-sensitive ribbon motor as the original, SIGMA 2 offers stunning clarity and definition in the top end but now also boasts richer mid and low tones. A pair of SIGMA 2 (either spaced separately or in X-Y configuratio) can be used for extremely effective overhead and room miking, upright or grand piano, string quartet and other ensembles. 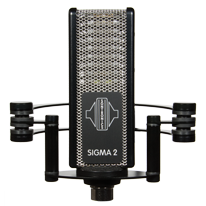 SIGMA 2, as with any ribbon microphone, should be used with care as its ribbon element is very delicate. However, with sensible placement and careful handling, SIGMA 2 will give you incredible results time and time again. For more detailed instructions on using and caring for your SIGMA 2 or servicing your ribbon element, please see our User Guide here. SIGMA 2 is supplied with its unique-style shockmount in a sturdy, foam-padded ABS flightcase, which will keep your mic safely stored between sessions or when transported from one venue to another.